Perfect for a simple Sunday lunch, this salad is rich with salmon and creamy avocado, balanced with touches of caramel and spice, and the clean bite of radishes. The recipe is based on one that I saw in the October 2014 issue of Delicious magazine. It’s one of my favourite food magazines, because the recipes are almost always easily achievable for the home cook and make much of seasonal ingredients that are available locally. Here in Brisbane we can almost always get beautiful avocados, which feature in the wonderfully named green goddess dressing that is at the heart of the dish. The most accepted theory regarding the origins of this dressing points to the Palace Hotel in San Francisco in 1923, when the hotel’s executive chef wanted to create something to pay tribute to actor George Arliss and his hit play, The Green Goddess. I have eliminated the anchovies, which are fish non grata at our place, and added a little more salt to compensate. Serve this salad with some fresh bread and a bright Sauvignon blanc for a gorgeous lunch with good friends. In a food processor blend together the avocado, buttermilk, juice of 1 lemon, garlic and chilli, until smooth. Season to taste with salt and pepper. In a pestle and mortar pound together the cumin, coriander, paprika and brown sugar until well blended. Heat a grill until very hot. Place the salmon on a tray lined with foil. Brush the salmon with a little of the olive oil and then rub the spice mixture all over. Place under the grill and cook for 5 minutes, until the top is a dark caramel colour and the fish just cooked through. Cover loosely with more foil and rest for 5 minutes. To serve, place a good spoonful of the goddess dressing on the base of 4 plates and smear artistically in the manner of a professional chef. Add the lettuce leaves. 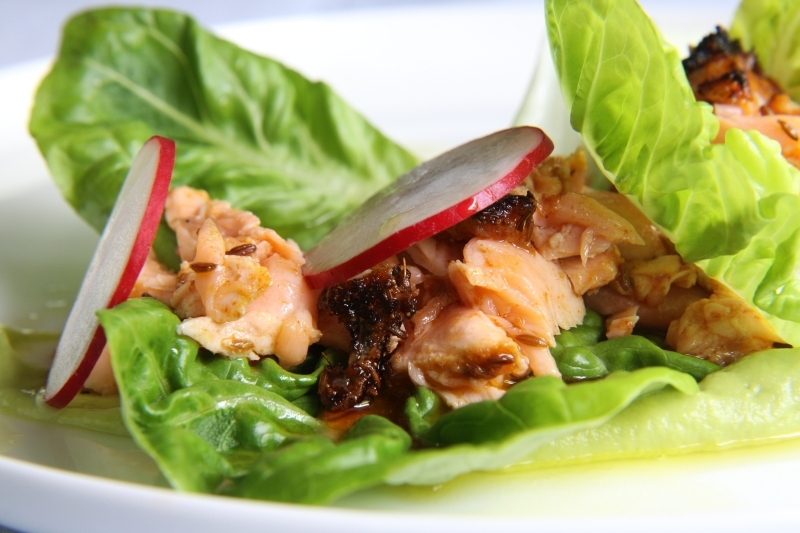 Break up the salmon into pieces and place on the plate before adding a few pieces of radish. Whisk together the remaining olive oil and the juice of the other lemon and drizzle over the salad.